At first I wasn’t sure if the Nescafe Dolce Gusto Genio coffee maker could hold up to my usual sky-high standards of excellence. Being a coffee-lover for decades, I have used countless different expensive and cheap machines. All of them either have major or minor flaws as the months pass after constant use. The Nescafe Dolce Gusto Genio is impressive because it costs only half of what you could expect to pay for similar machine and it works out exceptionally well. This coffee maker does exactly what I need it to and also offers a few bonus features that others don’t have. Choosing a product that you will use frequently is not always an easy task. Before I decided to buy the Nescafe Dolce Gusto Genio, I was looking for a machine that makes hot and cold drinks. The variety I found with this model is vast because I can make regular coffee, a cold latte, or hot cappuccino without waiting extra time for it. The Genio EDG455T does a great job of making high-quality beverages for every single season. I especially enjoy the perfect cream that comes from machine and makes a delightful addition to every morning. Besides the variety, the Nescafe Dolce Gusto Genio coffee maker is also equipped with advanced technology to enhance convenience and safety. There is an automatic standby feature which will turn itself off within 5 minutes of inactivity. This feature has helped me a bunch because the other members of my household use the machine after I do each morning and can never remember to turn it off. In addition to the energy-saving benefit, the Nescafe Dolce Gusto Genio coffee maker also works better than any single serve system I have used so far. It is powerful enough to brew quickly without burning the grounds. This is one of the best features because it ensures there is no bitterness or burnt flavors with the beverage. Also, the Dolce Gusto Genio is integrated with ThermoBlock technology which keeps the coffee fresh and warm for the next sip. There are many more beneficial features of the Genio. One is the adjustable drip tray which makes accommodating small or large cups much easier. The tray slides out with ease and also prevents stains or spillage when pouring. This helps to eliminate mess or unnecessary cleaning after brewing each day. Most single serve machines do not include features that make cleaning easier. The Nescafe Dolce Gusto Genio coffee maker comes with a removable water tank which makes emptying and refilling completely simple. Also, when the tank becomes dirty, it will be much more convenient to wash without cradling the entire machine. For me, cleaning is the most painful part of making your own coffee but with the Dolce Gusto Genio, I can brew as much as I want with minimal work. 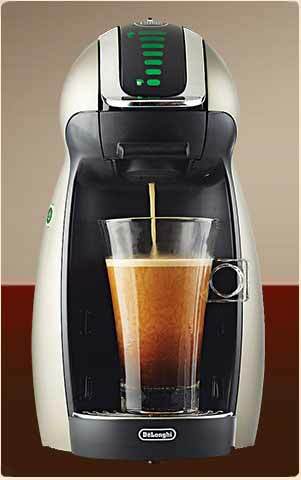 Probably the best feature offered on the Nescafe Dolce Gusto Genio coffee maker is the control lever. This helps me to customize the pressure of extracting so I can guarantee the best quality out of the coffee beans. The lever also allows you to control the texture and strength of each and every cup. The Nescafe Dolce Gusto Genio coffee maker is better than many other models I have compared with because its’ many unique features. Can you use any brand of k-cups or does it have to be the Nescafé brand?